Pick a Pergola. Give your garden a touch of Italian Renaissance style by installing an elegant pergola in your backyard. Composed of pillars, cross beams, and an open lattice, pergolas help you to loosely define an outdoor space without making you feel fenced in. 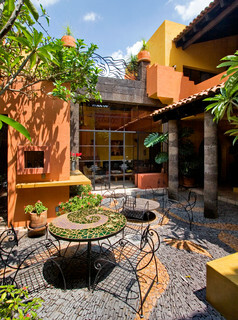 They can serve as a sitting area or a walkway while letting you enjoy the breeze and some light sun. Modern pergolas can be made from a wide range of materials, including wood, steel, fiberglass, aluminum, and vinyl, so building one to suit your style has never been easier! Let There Be Light. 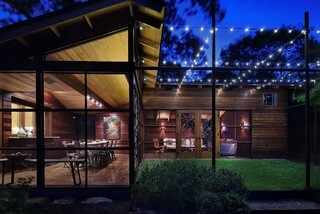 String lights are a gorgeous and inexpensive way to bring a little light and magic to your outdoor living space. And there are so many styles to choose from! Lanterns or fairy lights, incandescent or LED, solar or electric … all you need to do is figure out the type of mood you want to set! If you want a touch of whimsy, you can even purchase lights shaped like flowers, hearts, or stars. Bring The Heat. An outdoor fireplace is the perfect focal point of your next outdoor evening soiree. Whether electric, gas, or wood-burning, traditional brick, modern glass, or pit-style, gathering around a fabulous outdoor fireplace is a great way to spend your summer nights with your friends and loved ones. Get Cozy. Outdoor daybeds are a comfy new trend that is gaining popularity. You can use them for a sweet summer catnap on a lazy Sunday, or invite your guests to get extra comfortable at your next barbeque. Go rustic with reclaimed wood pallets or opt for opulence with vintage fabrics and exotic details. Lounge in true style this summer! Create an Amazing Mosaic. A stone mosaic patio is an absolutely stunning way to showcase your sense of style. The sky is literally the limit when it comes to this flooring option – all shapes, colours, and motifs are on the table. Use pebbles, pavers, and tile to create the perfect pattern to fit your personality. Show Your Playful Side. Want a patio that serves as a conversation piece AND a fun activity? Consider turning your backyard into a giant chess board . This is a great idea if you have children or spend time with a lot of chess enthusiasts. Checkmate! Make sure you contact us to speak with one of our design experts or visit our showroom for more ideas and a custom plan to spruce up your patio!